What is olive leaf extract good for? What is Oleuropein in olive leaf? Can I add olive leaf to pet food? Does olive leaf boost energy levels? Are Flavonoids in Olive Leaf? What scientific studies are there? Why the Mediterranean diet? Does olive leaf affect Heart Health? Is olive leaf safe to take? Can olive leaf combat antibiotic-resistant germs? How does olive leaf boost the Immune System? Are there recipes and preparation tips? How much olive leaf safe for children? What does olive leaf taste like? Q. What does Olive Leaf Extract do? Olive leaf works at the cellular level to measurably strengthen the body's immune response. The oleuropein in olive leaf is a natural wide-spectrum antibiotic, anti-bacterial, anti-viral, and anti-fungal. Unlike synthetic antibiotics, it destroys only the bad bacteria and protects the good. Medical research shows that when olive leaf is taken orally, it searches out and "deactivates" bacteria, thus inhibiting the replication of the bacteria. Olive leaf is a cold and flu buster that delivers effective inhibition and prevention of infection by a wide range of pathological microbes, including viruses, bacteria, retrovirus, fungi, yeasts and molds. Q. Does olive leaf contain Antioxidants? When the human body converts oxygen into energy, free radicals are formed as natural by-products of this process, the overproduction of which cause damage to the body. Antioxidants “scavenge” the free radicals in our bodies so that they don't promote too much oxidation, which can harm the walls and structure of cells, damage the genetic material inside a cell, and cause many serious diseases. Studies show that the olive leaf contains some of the most powerful natural antioxidants known. Most notably the compound Hydroxytyrosol. Q. How does Olive leaf affect Free Radicals? Free Radicals are bad. They can leave the body vulnerable to advanced aging, cardiovascular problems and degenerative diseases. Free Radicals can be caused by many factors: sun exposure, pollution, stress, poor diet, alcohol and smoke. The high antioxidant qualities of olive leaf (12 proven Antioxidants) have been shown to "scavenge" Free Radicals even more than Vitamin C, Green Tea, and Grape Seed Extract. Q. What is olive leaf good for? Researches have discovered that olive leaf is particularly beneficial, not only for patients suffering from specific conditions, but also the everyday individual looking to increase energy, boost their immune system and lower cholesterol. Q. What are the main beneficial compounds in olive leaf? The biggest key to olive leaf is a phytochemical compound called Oleuropein. Oleuropein is the major phenolic constituent of the olive leaf (Olea europaea) and it is also present in olive oil and fruit. It has a powerful anti-bacterial and anti-viral effects. It has proven to be useful in cases of yeast and fungal infections, herpes, chronic fatigue, allergies, psoriasis and many other pathogens. Since it works like a broad-spectrum antibiotic, it is useful against colds, flu, and upper respiratory and sinus infections. In addition, it has been shown to lower blood sugar, normalize arrhythmias, inhibit oxidation of LDL (the bad cholesterol), and relax arterial walls, thereby helping to lower blood pressure. Oleuropein also boosts energy. Several compounds from olive leaves, oleuropein among them, have shown a variety of biological activities as an anti-microbial antioxidant. Hydroxytyrosol is believed to be one of the most powerful antioxidants. Its oxygen radical absorbance capacity is 40,000 umolTE/g, which is ten times higher than green tea. The antioxidant polyphenol is known for it's activity in preventing or reducing the deleterious effects of oxygen-derived free radicals associated with numerous inflammatory and stress-related human and animal diseases. It is also effective at inhibiting LDL oxidation associated with atherosclerosis. Tyrosol is a phenolic antioxidant. As an antioxidant, tyrosol can protect cells against injury due to oxidation. It's good bioavailability indicate that it may have an important overall effect. This effect may contribute significantly to the health benefits of the Mediterranean diet. Q. Why the Mediterranean diet? Olive leaf is a diet staple in many Mediterranean cultures that enjoy a low incidence of viruses, cancers and heart conditions. Many people's diets are completely absent of olive leaf, creating an environment for viruses, bad bacterias, yeasts, tumors and heart conditions to take hold. Fighting these invaders takes energy leaving the host (you) tired and susceptible to other pathogens. Olive leaf stuns invaders and unleashes the immune system to create a balanced body. When used preventatively many conditions never take hold or symptoms are reduced and shortened. Q. Is Olive Leaf good for the Heart? Like the polyphenolic component of red wine, resveratrol, oleuropein imparts some important antioxidant benefits that may help prevent the oxidation of LDL cholesterol and support healthy heart function. Olive Leaf causes bad cholesterol to slip off platelets in blood vessels, preventing coronary artery clogging. The anti-inflammatory, circulation and vasco-dilating properties of olive leaf relaxes arteries and helps reduce hypertension, lower high blood pressure and stop arrhythmia. Q. Does olive leaf boost energy levels? One of the most frequent comments we hear from clients after they start taking olive leaf is that they feel more energetic and have a greater sense of well-being. Many want to continue the supplement even after their treatment program has cleared up or reduced specific problems. Some people are energized to the point that they inquire whether there is an "upper" in the product. There is not. It simply generates a natural "upper" effect. Healthy people who take it say they also feel this infusion of energy without caffeine. Q. I have heard of adding olive leaf in pet food, how? Why? This comes up more than you would expect; pets fight infections too. Thanks to pet owners everywhere we have many customers adding olive leaf powder to pet food and olive leaf powder to pet wash for topical application. Q. Is it okay to take olive leaf extract supplement every day? Yes, olive leaf is safe to take daily. As with all herbal products consistency is critical for success. Olive leaf is no different. Consistent delivery with breaks is a common practice. By taking a couple of days off each week and a week off each month you give your system time to assimilate the herb. Our bodies can only assimilate so much olive leaf each serving, so try to spread out delivery over 2-3 servings per day if possible. It is also ok to change the delivery method i.e. one day capsules, one day tea, one day extract, some powder and so on. The point is stay with the supplement without overdoing it. Refer to our Cautions page for further information on olive leaf's detox effect know as the "Herxheimer reaction” and interactions with some drugs. Olive leaf can be combined with other herbs/teas/supplements to create flavorful, healthful blends. Many of our customers find varying the delivery method (tea 1-3 days/week, capsules 1-3 days/week, extract one day and powder 1-2 days per week) of olive leaf is a good way to keep it in the diet. Our bodies are constantly metabolizing our intake so remember consistency is the best bet for any dietary supplement. Q. How can Olive Leaf Extract boost the immune system? Your immune system is your coat of armor protecting your from many diseases and infections. When the immune system is working properly you do not suffer very long from cold, flu, and hundreds of other diseases . Unlike antibiotics Olive Leaf does not build up immune system resistance. A strong immune system will recover from a pathogen invasion, and most of the time you will not even be aware of the battle that took place within your body. However, if your immune system is not functioning at its peak efficacy, you may be sick for an extended period of time. Once the immune system is over-burdened with some type of pathogen, (virus, fungi, yeast, bacteria, parasites) disease takes a foothold and sometimes it takes months and even years to manifest itself. In the meantime, the pathogens are in your body draining strength from the immune system. Olive Leaf does not cure any disease. It is, however, a killer of many pathogens (Alternative Medicine Review). Once pathogens have been killed off, the immune system rebuilds itself, ridding the body of disease symptoms. Q. What can Olive Leaf do to combat antibiotic-resistant germs? Many medical researchers are becoming increasingly concerned about the emergence of "super " germs that have developed a resistance to antibiotic drugs. Olive leaf is increasingly used in Europe as a replacement for synthetic antibiotics. In the USA likewise, olive leaf is being used by a growing number of medical practitioners. To combat this unseen enemy, medical scientists have been creating ever-stronger antibiotics., but these organisms have brought new meaning to the word "mutant." They mutate faster than science can create new antibiotics. Each new generation seems more aggressive in its invasion and less responsive to antibiotics. To add to the dilemma, the immune system has undergone its own "mutation" process, failing to respond to older, redundant antibiotics and quickly becoming "immune" to the effects of newer ones. The immune system actually becomes weakened over extended use of antibiotics, making it more susceptible to the invasion of pathological organisms. In short, a paradox has been created. Stronger organisms require stronger antibiotics, which create stronger organisms. Fight back with olive leaf. Olive leaf and it's extract (OLE) is an antimicrobial herbal botanical that has the power to control many troublesome conditions that antibiotics are often used to treat. The human body does not build up a resistance to OLE as occurs with antibiotic use and abuse. Additionally the use of antibiotics in chicken, pork and beef has reduced their effectiveness in humans. Because of the decreasing effectiveness of antibiotics, health experts predict that common bacterial infections will one day pose serious health problems. Olive leaf extract appears to work at many different levels in the body. As a result we often hear reports from patients that a variety of symptoms begin improving. Q. Are Olive Leaf's Flavonoids beneficial? Flavonoids – commonly referred to as bioflavonoids – are commonly known for their antioxidant activity. Since the late 1800s, scientists and pharmaceutical companies have documented the botanical’s cardiovascular, pathogen-killing, and energy-giving properties. Emerging scientific evidence has also shown that the flavonoids from the polyphenol category (olive leaf), have antioxidant powers greater than those of Vitamin C, Vitamin E, green tea and beta-carotene. 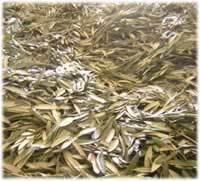 There are over a hundred brands of olive leaf, but only Olivus® specializes in olive leaf-based products exclusively. Q What does Olive Leaf tea taste like? Olivus olive leaf tea has a unique taste. A light steeping delivers a satisfying mellow flavor. Longer steeping or brewing in a tea press creates a stronger, slightly bitter infusion than can be mellowed with a slice of fresh lemon, stevia, soy milk, sugar and other herbal flavorings. Olivus olive leaf tea also blends well with Green tea and other teas and herbs. Q. Are there any side effects to using Olive Leaf? It is generally agreed that olive leaf does not produce adverse side effects. Please consult your physician if you are taking any prescription medications. Some people may experience what is known as Herxheimers Reaction, which may give the feeling the symptoms are temporarily getting worse. This most likely is a sign the olive leaf is working! This is due to a detoxification reaction to the olive leaf killing a large number of harmful germs quickly. If this should happen, stop taking olive leaf for three to four days and drink as much water as possible. Resume at half the amount you were taking for another three to four days. If you do not feel worse then proceed to increase dosage. Another side effect is getting an upset stomach when taking before meals (without food). It is ok to take olive leaf with or after your meal without reducing the effectiveness.